There’s more to an oil change than a quick service every three thousand miles. 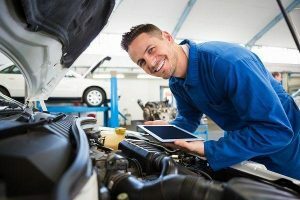 Drivers who want full value and performance from their cars should always go the extra mile with preventative maintenance services offered by Art Morse Auto Repair. At Art Morse, we pride ourselves on fast, detailed, and friendly service have a dozen other services for your vehicle while you wait for your routine oil change to be completed. Have our technicians work on flushing systems, replacing filters, and more in the time it takes to change your old oil with new oil options. Why wait for your auto parts to wear down or fill with gunk? Preventative maintenance is key to getting long-lasting performance out of your car. Here are a dozen services that are part of our 14-point service we provide that ensure other components of your car are running well. Coolant Exchange: Keep your engine hydrated while running, especially in the summer. Coolant works by circulating from the engine and through the radiator. If you waited too long to replace your engine oil, odds are that your coolant levels are low. Art Morse technicians measure your coolant levels and top it off for quality service. Fuel System Cleaning: Purging your your fueling system of water, varnish, dirt, carbon and other deposits is crucial to a vehicle’s fuel economy. A thorough fuel system flush removes anything hindering the three components of your fuel system: pump, filter, and injector. Engine Flush Service: This service improves your engine’s performance by clearing away gunk buildup inside the engine. Drivers who do a lot of stop-and-go driving, or wait too long for their next oil change, often build up more gunk than the average driver. Air Filter: Giving your engine some fresh air can improve your gas mileage over the next 15,000 miles (or until it gets too dirty). Air filters let the engine breathe while protecting the motor from taking in dirt, dust, and other particulates. If you don’t regularly change out your filter, these particles can reduce your fuel economy and lower the lifespan of your car. Wiper Blades: These need replacement twice a year, or until you notice them skipping or streaking over your windshield. Functioning windshield wipers are a mandatory component for safe driving in wet weather. Light Replacements: At each oil change, we go the extra mile and check your headlights, tail lights, brake lights, high beams, and indicators on the front and back, and anywhere else with a bulb. The lights on your car keep you safe and seen at all hours. We offer to replace anything that might have burned out. Automatic Transmission Fluid Change: Most manufacturers call for automatic transmission maintenance to occur every 100,000 miles or so. With that said, transmission deteriorates over a long time and can raise the operating transmission temperature if nothing is done. If your demand a lot out of your vehicle, you should check your transmission fluid to make sure it hasn’t turned a burnt hue. Usually that’s a telltale sign that you need a transmission fluid change. Serpentine belts replacement: The serpentine belt drives multiple peripheral devices in your car’s engine, like the alternator, pumps, air conditioning compressor, and other components. After around 30,000 miles or more, serpentine belts eventually wear out and fail. That’s why staying on top of your serpentine belt’s wear and tear reduces the catastrophic risk of belt failure. Cabin Filter Replacement: These filters prevent dust, pollen, allergens and other pollutants from circulating through the A/C and heater in your vehicle. After about 15,000 to 25,000 miles, these should be replaced with new filters so you and your passengers can breathe easy on the road. Differential Services: Differential fluids also need replacement every so often to maintain a healthy vehicle. Your front and rear differentials let your car turn with the winding road. New differential fluid lubricates the gears that are vital for taking smooth and controlled turns. Power Steering Flush: Every 75,000 to 100,000 miles, your power steering needs to be flushed. You may hear a high pitched whine coming from your engine if your power steering fluid is low. Fuel Filter Replacement: A fuel filter cleans your fuel and helps protect fuel injectors. If they get clogged with sediment will damage the fuel pump over time. Invest in a fuel filter to get the most out of your car’s fuel efficiency. Drivers should consider the kind of oil that will perform best for their vehicles. If you’re a long distance commuter or a city driver, chances are you need an oil with a weight and viscosity specified to fit your driving habits. There are a number of different oil choices one can choose from, depending on the performance a driver needs from his or her car. High mileage oil provides better combustion for long-distance drivers. If you’ve logged over 75,000 miles with your car, this is the right oil for you. High mileage oil contains additives that reinforce seals and prevent leaks. Synthetic oil options are a necessary choice for high performance engines. Though synthetic oils cost more, they outlive and outperform outperform conventional oil by 50%. Synthetic oil also keeps the engine cleaner and absent of mineral buildup, making it a clear choice for any sports car enthusiast. Synthetic blend oil options are often tailored for SUVs and trucks that tow, haul, or transport your family from A to B. 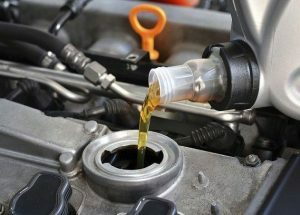 Though not as pricey as full synthetic oil, a blended synthetic oil provides less mineral build-up than conventional oil, and lasts longer too.